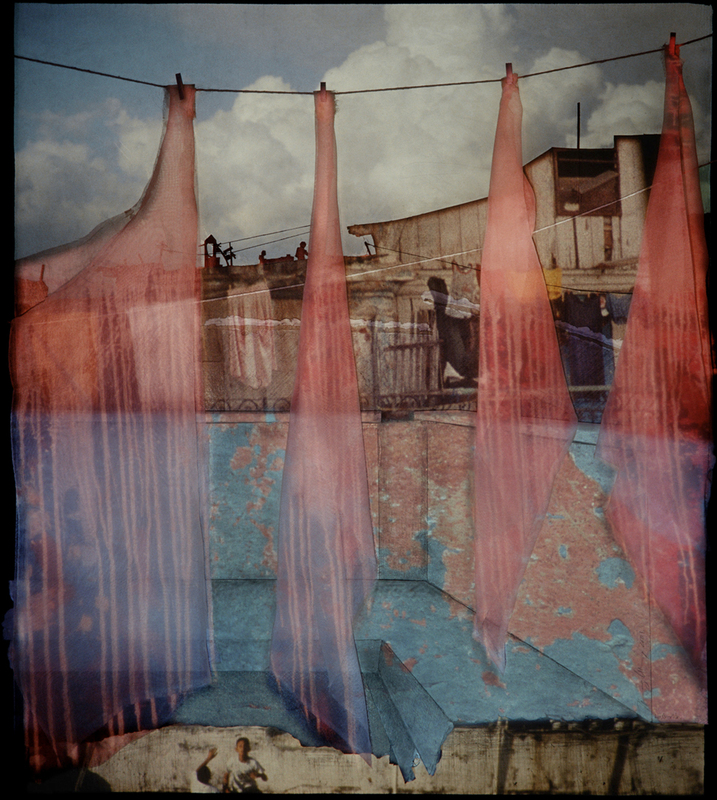 Nancy Goldring, La Guarida, 2011, framed Cibachrome, photographic projection, 30 x 34". ONE OF THE MAIN LINES OF INQUIRY that has driven my work for so many years concerns how to conjure placewhether a dreamscape, a town or country, somewhere you have never been, or the studio in which you spend your days. The challenge is to find a way to include how you anticipate it, how you encounter it, how you remember it and store it away, and what it reminds you of. In that respect, the notion of place is open-ended, and my work is not so much about picturing a place as about finding a way to represent our experience of it in the fullest sense. Some places I’ve gotten to know over long periods of time, like Italy, but I have spent many years traveling around the worldfrom Indonesia to China to Syria to Sri Lanka to Cubamostly through grants, trying to understand where I was by making extensive drawings and taking photographs. These document the place and, at the same time, reveal the notion that we can never fully grasp what we see. The process then becomes an intense struggle to fathom what is unknown and unknowable. It sets in high relief that you can never fully understand a place, while underscoring the importance of trying. I never intended to develop a technique as many photographers do. It’s more like Wallace Stevens writes in “So-And-So Reclining on Her Couch,” where the poem becomes a pendulum moving between the mechanism or apparition and back again to the invisible gesture that suspended it, in a condition of constant change. For some of the works, there is a general procedure from which I often deviate. There is the drawing that works out what I see and will become the model for the finished piece, essentially serving as the architecture, and meanwhile, I am shooting lots of slides, gathering material. I then craft a relief model based on the drawings­: a collage that suggests a more profound space than a flat surface could provide. After that, I take snippets of the slides by masking them out, and using three, four, or even five projectors, I meld them into a single image by projecting them simultaneously onto the modelsome from the front and some from the rearand take a picture. And then I change the slides and continue the process. The layering becomes an archaeology or history of the encounter with that place. Besides restructuring space, I frequently play with scale. I might have taken a picture of a rock and then projected it onto a composition so it reads as a mountain. This kind of experimentation is potentially endless, and at a certain point I stop when I feel I have suggested that the possibilities are infinite. Piet Mondrian’s “Pier and Ocean” series of 1917 has always been a great influence in the way it negotiates the notion of the infinite by pushing it to the edge of legibility toward abstraction, while nonetheless insisting on its meaning as place. I have never used slides taken in one place for another piece. It’s important that the images are built of actual material to make them authentic or true. I don’t know exactly why that is, or why it is so important to me, but it gives some guidelines to the process. For instance, while making the series “Via dei Solitari”which friends thought was a nod to romantic solitude but is in fact titled after the street where I lived that leads up to a monastery in Sarteano, ItalyI drew the same view for four to five hours a day. It was difficult to render because of the medieval town’s structure with its winding, interconnected streets. But after about five weeks, I felt I nailed it. I find this way of drawing helps to crystallize or fix the place so indelibly that I can draw it without looking. I had also been photographing that vista and its surrounding landscape. The photographic material then reappears cropped and resituated in the “foto-projections.” In this way, they suggest how we move through the town gates, carrying the landscape with us. In this series, I’m conflating time and space, past and present, into a single image that is both townscape and landscape. There are, of course, many examples of artists capturing a place as they felt it, but I’m more interested in negating the concept of a single vantage point to correspond more accurately to human experience. I still use analog methods because digital doesn’t create the kind of space I am trying to evoke. The latter describes forms through precise edges rather than chiaroscuro modeling, which is a different system entirely. And for forms to seem to recede into the remote distance you also need to deploy atmospheric perspectivethings should appear to disappear, dissolving as they approach the vantage point. Analog systems work better for creating this effect. As I project onto the model, the light creates profound shadows, heightening the sense of depth. I intend for the work to end up assuming a convincing level of realism, improbable though the views are. I have been surprised to see people interact with my installations, mistaking the illusion for reality by putting a hand through what they thought was a tunnel or field. It’s fun to see.